Louder Than Life has announced that Seattle alt rockers ALICE IN CHAINS will be joining the lineup for the 5th annual festival, which comes shortly after the release of the band’s new album, Rainier Fog. 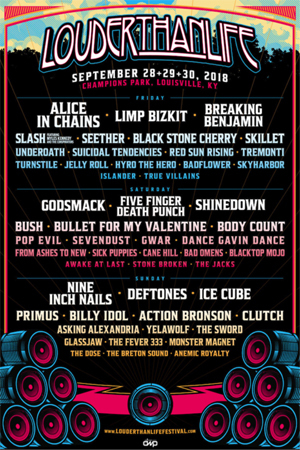 They join previously announced artists NINE INCH NAILS, DEFTONES, GODSMACK, and many more for the festival, which takes place Friday, September 28, Saturday, September 29, and Sunday, September 30 at Champions Park in Louisville, KY.
After a week of steroids the swelling went down enough to see the cause of the problem. A blood blister has formed on my vocal folds and is preventing them from vibrating properly. In short, I can’t sing anything at the moment and the more I attempt to the more damage is being done. Luckily, as of now the doctors feel that 3 months of no singing and voice rest should get my cords back on track. Louder Than Life 2018 partners and sponsors include: Monster Energy, f.y.e., The Music Experience, Miller-Coors, Jack Daniel's, Tito's Handmade Vodka, Robert Mondavi Private Select, Black Box Wines, Caduceus Wines, Diesel Cigars, SWFTCharge, Kentucky Lottery, Roadrunner Records, Fxck Cancer, Take Me Home, The Louisville Water Company and more.